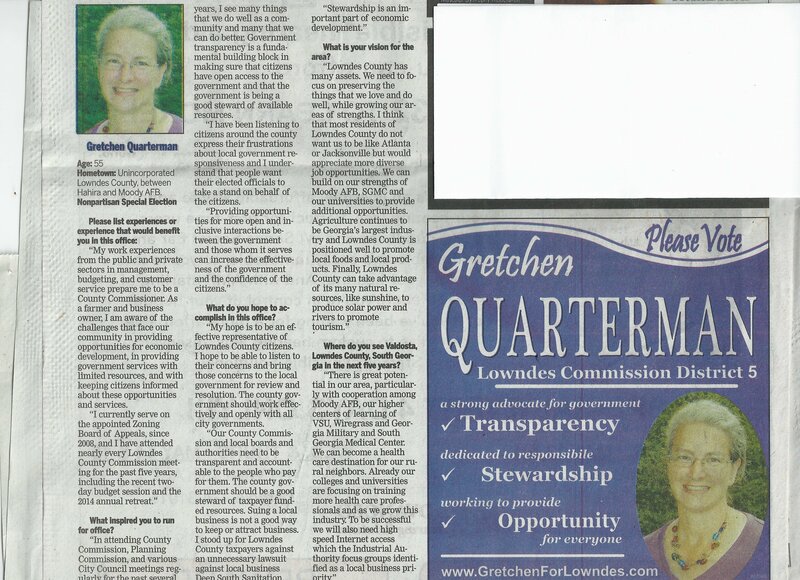 Gretchen’s ad ran next to her interview answers Sunday a week ago in the Valdosta Daily Times. 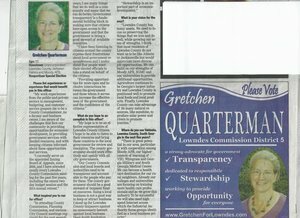 Here’s why you should please vote for Gretchen tomorrow for Lowndes County Commission District 5. Remember, not November: it’s a Special Election tomorrow, Tuesday May 20th. Hometown: Unincorporated Lowndes County, between Hahira and Moody AFB. Office: Nonpartisan Special Election, Lowndes County Commission Super District 5. “My work experiences from the public and private sectors in management, budgeting, and customer service prepare me to be a County Commissioner. As a farmer and business owner, I am aware of the challenges that face our community in providing opportunities for economic development, in providing government services with limited resources, and with keeping citizens informed about these opportunities and services. This entry was posted in Opportunity, PR, Stewardship, Transparency and tagged business economy, Georgia, Gretchen Quarterman, Gretchen Quarterman for Lowndes County Commission, gretchenforlowndes, Hahira, Internet access, Lowndes County, Moody AFB, opportunity, PR, SGMC, solar power, South Georgia Medical Center, stewardship, transparency, Valdosta Daily Times, Valdosta State University, VDT, VSU, Wiregrass Tech on May 19, 2014 by John S. Quarterman.